I’m away on a 3 day writing retreat where I’m trying to put together a full draft of the Delphi study that I’m busy wrapping up. I thought I’d take a break from writing and do something different (from writing, I mean). I took the full text of the open-ended responses from the first round of my study and created this Wordle…because I can. 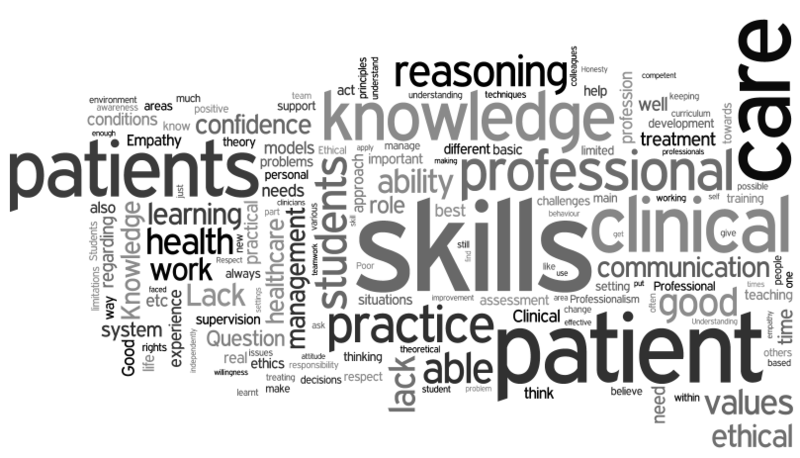 The questions were related to the attributes that clinicians and clinical supervisors thought healthcare students should have. In February 2010 I came across this blog post discussing the possibility of writing a draft literature review in a short period of time i.e. 1 hour, which I found intriguing. I left a comment on the post saying I was keen to try, and also bounced the idea around on Twitter a bit, but nothing came of it. I’ve kept it in the back of my mind though, and recently tried to put more structure into the idea. The following is a simple method for putting together a small, focused team to write an academic article very quickly, without sacrificing quality. The idea is to produce a draft article in a short period of time (a “sprint” of a few hours) by collaborating in small teams of distributed authors, potentially even from different disciplines, who each bring different skills to the writing process (e.g. editorial, methodology, theoretical frameworks, etc). The primary author is the organiser / planner / person who pulls it all together. The team is organised by the primary author according to the skills that are necessary for a particular piece of work. In addition, unless the work is only going to be a literature review, someone needs to bring the data to the sprint. Since the person with the data is the most likely person to have a good understanding of the study, this person will most likely be the primary author. Contributors are all acknowledged as authors, unless their contribution only qualifies for an acknowledgement. For example, if certain team members are asked to conduct a critical review of the draft when it is finished, they may not qualify for author status. See below for a template of the tasks required to complete a draft. All team members will agree to their tasks prior to beginning the writing process, as well as understanding the requirements for authorship credit. Team members choose a date and period of time to dedicate to the process. The primary author determines the main tasks and preparatory work that the team must complete so that when the sprint arrives, members are prepared. This includes clearly defining the aim, objectives, etc of the article prior to beginning writing. The idea is to use the time to write, not to search for literature, so all preparation should be done beforehand. Authors should use online collaborative tools like Google Docs and Skype where possible, in order to work together in real time. I’m writing this after having read Christina’s post on her thoughts on the PhD process, and following a few of her links to other PhD students who are blogging their own progress. As I’m going through a little slump at the moment, I thought it might be useful to write a short post on where I’m at right now, to review what I’ve done so far. A few weeks ago I spent 3 days on a writing workshop with colleagues in my department who are also registered for their PhD’s (there are 4 of us), where I worked on my systematic review (see the proposal). I managed to trim the original 103 articles that I gathered during my first, second and third search rounds, to about 60. Then I went through those 60 with a more critical eye, removing what wasn’t appropriate. Finally I narrowed the list down to 20 articles that we eventually conducted independent critical reviews on, and came to consensus with my supervisor, where we finally agreed on 7 articles that matched my inclusion criteria. The article is now ready to be written up, although I’m uncertain of the format. The outcome of the systematic review will be a peer-reviewed publication that identifies some of the ways in which blended learning has been applied in clinical education, and which will inform the development of my own module (one of the later objectives). My fourth year research group has just finished capturing the data they gathered from a survey we drew up together, where they looked at the role of social networks to facilitate reflective learning. This survey forms part of my first objective, as well as the first component of my SAFRI project (which will later include focus group interviews with staff members, and an additional survey of the students). Immediately after conducting the survey, I have also held workshops with 2 classes so far, to facilitate the process of working within the network, and will be completing workshops with the last 2 classes in the next few weeks. Tomorrow the group will submit an outline of the first few sections of a draft article, and I’ll be presenting some tentative results at the SAAHE conference next week (see the abstract). I’ve also recently finished a first draft of an article based on a small, wiki-based project I ran in our department last year (you can still comment on it). Strictly speaking it’s unrelated to my PhD as it doesn’t fit into the proposal, but is still work in a related field. Finally, I gave a presentation on PLE’s to the Centre for Teaching and Learning at Stellenbosch University. Again, PLE’s are not explicitly addressed in my PhD proposal, but as I’m leaning more and more towards that concept as having great potential in reflective learning, I think it might ultimately end up playing an important part in the project. Now that I look back at my progress over the past 6 months, maybe a short break is in order…? I just had my first research article published. It’s based mainly on the literature review I did for my Masters degree last year, with a few updates. It’s strange, but when I submitted it about 6 months ago, I thought it was a reasonable piece of work. Reading it now, I feel like taking it back and editing the hell out of it. Does anyone else look back at their earliest work and feel like hiding under a table? I’m putting the abstract up here in case anyone is interested. The title of the article is “Information and communication technology in health: a review of the literature”. Information and communication technology has been shown to be increasingly important in the education andprofessional practice of healthcare workers. The World Health Organisation (WHO) discusses the benefits of using ICT in the Primary Healthcare setting in terms of better access to information, improved communication between colleagues, facilitating continuing professional development and providing learning tools for healthcareprofessionals, patients and the community as a whole. This review of the literature describes the role of information and communication technology (ICT) in the education and professional practice of healthcare workers and goes on to outline the challenges facing the widespread adoption of ICT. The conclusion is that ICT does indeed have a positive role to play in both the education and professional practice of healthcare workers, including physiotherapists, as long as it is implemented as an adjunct to established and proven practice, and not a replacement. The 6 minute walk test is a common outcome measure of endurance used by physiotherapists and students. I’m not sure of the full significance of this article, but it seems to indicate that the test may not be a useful indicator of outcome in patients with mild pulmonary hypertension.